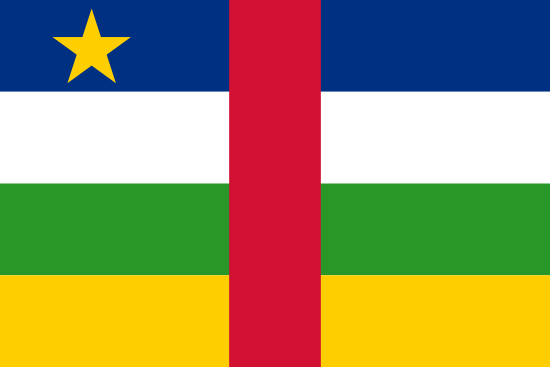 Recent reports of a more stable political environment and more effective economic policies in the Central African Republic (CAR) have begun to indicate the possibility of a more positive future for the 4.4 million citizens of this low-income, landlocked, resource-rich and sparsely settled nation that occupies an area roughly the size of Texas. Constraints to realizing greater economic growth and human development are enormous: inadequate transport infrastructure; banking infrastructure incapable of supporting greater investments; low levels of technology; high levels of illiteracy; limited access to healthcare and education; and neighbors experiencing ongoing domestic and regional conflict (with frequent spillovers into the territory of the CAR). USAID does not have a presence in Bangui, and threats of violence have occasionally caused the US Embassy to close its doors. The United States government (USG) provides development assistance largely through the medium of regional projects. Governance of the mineral and timber resources of the country is of concern to the USG. The Congo Basin forest reserves are second only to those of the Amazon; many view the sustainable management of these reserves as a key to mitigation of climate change. While the CAR does not possess the largest segment of the Basin forests, timber exports are an important source of export revenues, and the sector provides a substantial amount of employment in CAR. USAID’s Central Africa Regional Program for the Environment (CARPE) includes assistance to the CAR because part of the Sangha Tri-National area – one of CARPE’s 12 priority landscapes – is located in the CAR. The USG is also interested in ensuring that the CAR’s diamond reserves are managed in accordance with the Kimberley Process, which tracks the source of diamonds in an effort to identify “conflict” diamonds, and appropriately recognizes the property rights of the small-scale artisanal diamond miners. The Property Rights and Alluvial Diamond Development (PRADD) pilot project was launched in 2007 in the CAR as a joint activity by the US Embassy and USAID and has already demonstrated practical ways to achieve these goals. The majority of CAR’s population is rural, dependent largely on farming or animal husbandry (primarily in nomadic systems) for food and incomes. Conflict and violence have periodically displaced people from their homes, increasing the threat of hunger and food insecurity. Because poor transport and market infrastructure have limited the potential for commercial production and possible export to neighboring countries or to world markets, much of the production is destined only for family consumption or local-market sale. Two-thirds of the population is estimated to live below the poverty line. The United Nation’s Human Development Index has placed CAR at or near the bottom of the rankings for many years. Greater security of land tenure rights could help to increase investments for productivity, especially in small irrigation facilities and for women farmers, but an array of other interventions will also be needed to improve the productivity and performance of the agricultural sector overall. If the USG or other donors to decide to invest greater resources in addressing critical issues of property rights and resource governance, the first questions will be where to begin and how to sequence interventions. The people of CAR prioritize their needs as follows: restoration of law and order, followed by transparent and effective management of public services; increased income (especially in rural areas); and improved access to social services, particularly housing and water. As long as stability and peace are maintained, both through the 2010 elections and beyond, efforts to strengthen the legal and institutional foundations governing access to land, security of land rights, and sustainable and fair exploitation of CAR’s mineral and forest wealth would appear to be of high priority. Specific areas for action are detailed in the next section. CAR’s legal framework for land rights is dated, and the administrative structures established to govern them have limited reach. While more work has recently been done to establish a Forest Code that recognizes different users of forest products and services, growing markets for tropical woods and the possibility of greater exports through the Democratic Republic of the Congo may challenge the government in its implementation of the 2008 Code. Donors have several opportunities to collaborate with each other and with the government in developing a relevant legal framework (and implementing institutions) for land and forest rights. USAID has already made some contributions through its CARPE support, for example, but it could also draw on significant experience with legal frameworks and comparative knowledge of those in comparable countries to design and draft a comprehensive framework that: (1) capitalizes on the strengths of the country’s customary laws and traditional institutions; (2) provides the architecture for adoption of the rule of law and realization of the principles of equity and justice set forth in the country’s Constitution; (3) integrates principles of decentralization of governance; and (4) provides for the protection and improvement of the rights of women and marginalized populations such as forest dwellers, pastoralists, and nomadic herders. Urbanization accelerated during the years of civil conflict and violence, and an estimated 40% of the CAR’s population resides in urban areas. Little is reported about the numbers of people living in informal settlements in peri-urban and urban areas or their settlement conditions. A focused assessment of urban land tenure conditions could enable donors – and the government – to ensure that an appropriate legal framework for formalizing the rights of squatters and other residents to the plots on which they live is put in place. The PRADD pilot project has been a useful limited way for the United States to engage with the CAR on critical issues of resource governance even without a full-time USAID presence in-country. Donors could also consider piloting efforts to decentralize control over natural resources and develop community-based natural resource management models. USAID, for example, could use its experience in creating community-based forest management programs in sub-Saharan Africa or its prior work with water-user association development to shape these pilots. The experience for these pilots, coupled with CAR’s own experience, would help inform regulations and program procedures and create decentralized, community-based resource governance models. The Central African Republic (République Centrafricaine, CAR) is a landlocked, sparsely populated country that is well-endowed with natural resources. CAR has abundant land, adequate soil, dense tropical forests, and a wealth of unexploited minerals. However, the country has a history of political instability and authoritarian regimes and military dictatorships alternating with one-party rule. The government and rebel groups signed a Comprehensive Peace Accord in 2008, and the government has taken steps to begin strengthening its core governmental institutions and bodies. However, opposition parties and others continue to vie for political power, and political instability remains a threat. Presidential and parliamentary elections have been delayed several times due to allegations that voting records are not complete and disarmament has not been achieved. A July 30, 2010 presidential decree rescheduled elections for January 2011. The history of political unrest and violence has paralyzed the country’s development. CAR has only 650 kilometers of paved road, no railroad, and limited air transportation. The country lacks basic services, hospitals, and schools. The country was ranked 178th of the 179 countries on the 2008 Human Development Index and has been at or near the bottom for several years. Two-thirds of the population lives below the national poverty line. Thirty percent of the population suffers from chronic malnutrition, 10% with acute malnutrition. Sixty-eight percent of women and 46% of men are illiterate. Life expectancy in CAR in 2007 was 44 years, ten years below the average in African countries. The northern region, which has been caught up in the conflict in Sudan, has become home to rebel fighters and while the populous northwestern region has been tense but stable since the 2008 peace agreement, the remote east and northeast continue to suffer from active indigenous rebellions and depredations from the Ugandan Lord’s Resistance Army (LRA). Thousands of farmers have abandoned their farms and are living in the bush. Others have fled to the cities, where physical security is more assured but water supplies and infrastructure are stretched beyond capacity. People who fled the violence have been slow to return home: as of January 2010, approximately 200,000 CAR citizens continued to be displaced and another 150,000 are refugees living in neighboring countries. Eighty percent of the population relies on subsistence agriculture and livestock for their livelihoods. Lack of infrastructure, weak purchasing power, and violence have constrained the development of markets. Land rights throughout much of CAR are considered insecure as a result of political instability, lack of confidence in the government, weaknesses in government institutions, and widespread social unrest. The potential in CAR’s land and other natural resources has yet to be realized: roughly a third of the country is considered suitable for farming, yet only about 3% is under cultivation. Close to half CAR’s land is suitable for grazing yet less than 15% is used. CAR is rich in forestland and forest resources, providing the population with fuel, food, shelter, medicinal plants, grazing land, and building materials. The timber industry serves as CAR’s main source of export earnings. This market is expected to grow as peace and stability in the Democratic Republic of Congo (DRC) has made export through the DRC easier, and Asian buyers are increasingly turning to Africa. This growth will have to be managed well to guard against overexploitation of CAR’s share of the Congo Basin forest and biodiversity resources. CAR also possesses considerable mineral wealth, most of it unexplored and unexploited, in part because political instability and conflict have provided few incentives to foreign investors and buyers. Artisanally mined raw diamonds, however, are a key export. The USAID and US Department of State’s joint Property Rights and Artisanal Diamond Development (PRADD) initiative has been piloting establishment of a property rights registry for artisanal miners to recognize and strengthen their rights. Roughly one-third of CAR’s total land is considered suitable for farming. Approximately 3% of land is under cultivation, 0.1% of cropped land is irrigated, and 5% is pastureland. The potential in the land has yet to be realized: roughly a third of the country is considered suitable for farming, yet only about 3% is under cultivation. Close to half of CAR’s land is suitable for grazing yet less than 15% is used (GOCAR 2007; World Bank 1998; Furth 1998; UNSC 2006). Eighty percent of the population relies on subsistence agriculture and livestock for their livelihoods, and violence has taken a toll. In the northern region of the country, bandits and rebels have burned villages, pastureland, and cropland. Seed stocks have been lost, irrigation infrastructure destroyed, and the population chased from homes, leading to decline in land-use and productivity. During the years of conflict, an estimated 60% of livestock owners fled to neighboring countries to preserve their stock, and thousands of farmers abandoned their farms. As of January 2010, about 150,000 citizens of CAR were still living in neighboring countries (GOCAR 2007; World Bank 1998; Furth 1998; UNSC 2006; UNHCR 2010). Forests cover 37% of the country, and 15% of the total land is classified as nationally protected areas. Deforestation is occurring at a rate of 0.1% annually (World Bank 2009a; GOCAR 2006). CAR is home to more than 80 ethnic groups, the largest of which are the Baya (33%), Banda (27%), and Mandjia (13%). Some groups, such as the 20,000 pygmies who live in the country’s dense forests, are quite isolated, almost entirely dependent on natural resources for their livelihoods, and vulnerable to exploitation from outside interests. Two-thirds of the population of CAR is below the national poverty line, 30% suffers from chronic malnutrition, and the country has ranked near the bottom of the Human Development Index in recent years (WFP 2009; UNHCR 2010; UNDP 2009; Foreign Policy 2009; AfDB 2009a). Most cultivated land in CAR is used for subsistence farming; farm sizes average between 1.5 and 2 hectares – the amount an average family can cultivate and protect. Most farmers use traditional cultivation methods, and productivity is low. In the past, nomadic herders who migrated to the northern areas where grazing land is abundant and rainfall good obtained relatively high returns. More recently their herds have been decimated by bandits and rebel forces. Persistent insecurity in the north has hindered resumption of farming and livestock activities (HDPT 2008; UNDP 2006; FAO 2005). The northern region, which has been caught up in the conflict in Sudan, has become home to rebel fighters and bandits who seize entire villages, steal livestock and equipment, and burn agricultural fields and food storehouses. As of January 2010, in addition to the 150,000 citizens of the CAR living as refugees in neighboring countries, the CAR had about 200,000 internally displaced persons (IDPs) and 27,000 refugees, primarily from Sudan and Chad (WFP 2009; UNHCR 2010; USDOS 2009; UNDP 2008; UNSC 2006). The 2004 Constitution of the Central African Republic provides that all persons have a right to property, and the state and citizens have an obligation to protect those rights. CAR’s Law No. 63 of 1964 (Loi No. 63.441 du 09 janvier 1964 relative au domaine national) abrogated the prior (and more comprehensive) Law No. 139 of 27 May 1960, which governed land tenure, and Law No. 60/76, which allowed individuals to obtain occupancy rights to land identified by the state for habitation. Law No. 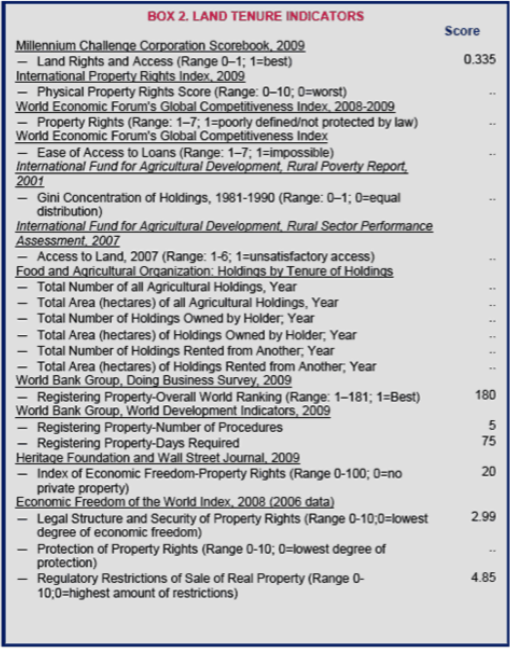 63 of 1964 defines the national domain and anticipates additional laws to address land tenure and private property. To date, no additional laws have been enacted; Law No. 63 of 1964 remains the primary formal law governing land rights in CAR. Law No. 63 recognizes customary law, but limits customary land tenure to use-rights. The law provides for the privatization of state land through land registration (GOCAR Constitution 2004; ARD 2007a; GOCAR 2006). Under Law No. 63 of 1964, state land is classified as either within the public domain of the state or the private domain of the state. The public domain of the state includes natural property (such as rivers) and artificial property (such as roads). The private domain of the state includes all unregistered land as well as landholdings that the state acquires through transactions and the exercise of eminent domain. Private parties can obtain private property rights to land in the state’s private domain (ARD 2007a). Private ownership. Under CAR’s formal law, an individual or entity can obtain ownership rights to land through registration of their interest as private property. Occupants of land can apply for ownership rights under the principle of mise en valeur, which awards ownership rights to those who develop their land intensively (e.g., by means of intensive or permanent agriculture). Ownership rights may be transferred by purchase, inheritance and lease. Less than 0.1% of land in CAR is registered (ARD 2007a; Furth 1998; World Bank 2008; World Bank 1998). Leaseholds (private and state land). Individuals, groups, and entities can lease land from the state or private parties under formal law and customary law. Leases of land within the state’s public domain are granted for definite periods, generally not exceeding 20 years; no lease can extend beyond 50 years (ARD 2007a; Furth 1998). Concessions/private ownership option. The state can grant concessions of land in its private domain to individuals and entities as concessions. The concessionaire must develop the land in accordance with the terms of the concession within two years for urban land and within five years for rural land. Concessionaires who have developed the land in accordance with the agreement and obtained the approval of the local government may apply for private ownership rights to the land (ARD 2007a). Right of habitation (state land). The state’s recognition of occupancy rights to certain land has continued despite the absence of formal law providing for rights of habitation. Upon application, the state issues a habitation permit that allows the applicant to occupy the land and erect any nonpermanent structure, including huts of organic materials. In some areas the permits are free and easily obtained. In peri-urban areas, permits are difficult to obtain and often require large payments and the permission of multiple officials. The length of time for which habitation permits are granted is unknown (Furth 1998; ARD 2007a). Customary tenure. Law No. 63 of 1964 recognizes use-rights to land based on principles of customary law. Customary law is a localized and evolving system, and no comprehensive studies have been published detailing the nature of the system as it is operating in CAR. Some general principles of customary law that are common to the central African region are thought to apply in the CAR, such as land being held collectively by the lineage or clan and the right of a first clearer of land to use the land. As the commercial value of land has increased, customary landholdings have become increasingly individualized and passed by inheritance within families (ARD 2007a; Furth 1998; FAO n.d.). Under formal law, individuals, entities, and groups can acquire land rights through purchase, concession and land development (application of the principle of mise en valeur) and rental. Individuals, entities and groups desiring ownership rights to land under formal law must apply for legal title and register the land. According to the World Bank’s Doing Business survey, registering property in CAR requires five procedures, averages 75 days, and costs 18.5% of the property value. Ownership rights must be secured through registration of the titles in the official land register. An estimated 0.1% of land in CAR is titled and registered. Registered land includes urban land in serviced areas and some commercial plantations. In peri-urban and urban areas, people can apply to the government for habitation permits, but they are often difficult and expensive to obtain (World Bank 2008; World Bank 1998; Furth 1998). Most people typically obtain access to rural land through inheritance and allocations from the lineage heads, who control land distribution and allocation under customary law. Most urban and peri-urban residents live in informal settlements either as squatters or with occupancy rights purchased on the informal market and recognized under customary law. CAR does not have legislation providing for the formalization of informal settlements (World Bank 2008; World Bank 1998; Furth 1998). Land rights throughout much of CAR are considered insecure as a result of political instability, lack of confidence in the government, weaknesses in government institutions, and widespread social unrest. Violence has displaced communities and destroyed villages and agricultural land, and some people who fled from their land have been permanently resettled elsewhere (Furth 1998; UNHCR 2010; UNSC 2006). The CAR Constitution guarantees equal rights to women and men and the right of all people to hold property. Whether the formal law permits joint titling of property is unknown, as is the incidence of joint titling. The 1998 Family Code provides for equal rights of women in marriage and divorce, and under formal law daughters and sons have equal rights to inherit property. However, the customary law and traditional practices that continue to govern the rights and obligations of people in CAR – despite enactment of formal laws – do not grant women equal status. Under customary law, men own marital property, and land rights transfer from the eldest male in the lineage to the next eldest male. As customary land tenure has become more individualized, families claim rights to transfer land within their families, and land passes from the father to son (GOCAR Constitution 2004; GOCAR 2000; USDOS 2001). Eighty-six percent of the female labor force was reportedly engaged in agricultural activities (compared to 64% of the male workforce) in the 1990s, yet almost none have rights to the land they farm. Women who are single, divorced, or widowed are not considered heads of household and are not considered to be landholders, only land users. Widows, and sometimes their children, are often evicted from their property by the deceased husband’s family. In households without an adult male family member, land rights will often be held by another male relative such as an uncle or cousin instead of a woman. Polygamy is legal in CAR, and men can take up to four wives. The 28% of women who are in polygamous relationships, including 21% of girls aged 15–19, have no rights to property (OECD 2008; World Bank 1998; GOCAR 2000). Women in CAR often lack the education and social status to assert their legal rights. Sixty-eight percent of women in CAR (compared to 46% of men) are illiterate. Women are poorly represented in the country’s political and administrative bodies (under 5%). Fewer than 3% of judges and lawyers in the country are female, and legal-aid services in the country are limited (UNDP 2008; GOCAR 2000). The CAR’s Land Registry (Conservation Foncière) is responsible for maintaining the cadastre and recording land transactions. 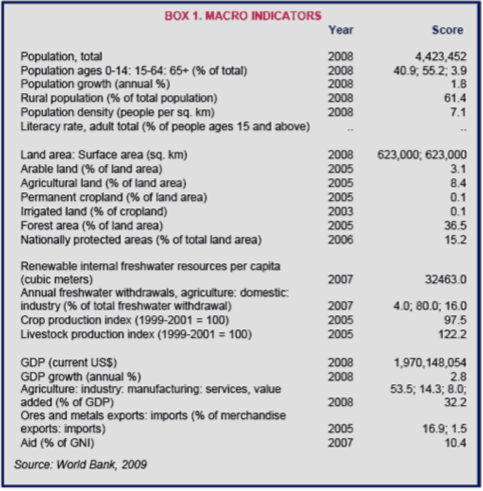 Very little land (an estimated 0.1%) is registered in CAR (IMF 2009a; World Bank 2008). The Ministry of Agriculture is responsible for planning, supervising and coordinating the country’s agricultural policy and programs. Two governmental bodies, the Central Agency for Agricultural Development and the Central Institute of Agricultural Research, are responsible for coordination and execution of training and research, respectively. The bodies have been undergoing reorganization in the course of implementation of CAR’s Poverty Reduction Strategy Paper (2008–1010), and the Food and Agriculture Organization (FAO) is working with the government to create a National Midterm Priorities Framework that is expected to include plans for organization of the sector’s governance bodies (FAO 2005; World Bank 2009c). The Minister of State for Rural Development (Ministre d’Etat au Développement rural) is responsible for developing and implementing the country’s rural poverty-reduction and growth strategy. As of 2009, efforts to build government capacity at national and regional levels were underway, with development of policy anticipated in 2011–2012 (World Bank 2009c). Under customary law, which dominates land access and tenure for most of the population of CAR, lineage heads and chiefs have traditionally controlled land distribution and allocation. In recent years, the chiefs, who are often government employees, have begun to serve as intermediaries between people seeking land in certain areas and the relevant lineage heads (Furth 1998). There is no formal land market in CAR, although there is evidence of the increasingly commercial value of land, especially in areas with significant natural resources (such as minerals) and serviced plots in urban areas. Individuals and entities seeking private ownership of land can obtain a concession for state land, which with local government approval can be transferred into an ownership interest. The government uses rental values to determine a tax base in urban areas, but has difficulty collecting taxes. The extent to which an informal land market operates in CAR is unknown (Tayoh 2009; ARD 2007a). Article 14 of the 2004 CAR Constitution provides that no one can be deprived of property except upon a legally sound showing of public purposes and on payment of compensation prior to the taking. The state can also repossess any land that it deems has not been put to proper use, a concept that is broadly defined. Law No. 63 of 1964 includes the principle of eminent domain as an extension of the state’s public domain. The state has authority to acquire land for purposes of urban planning, public security, aesthetics, and development of rights of way, and services such as communications and sewer systems. The extent to which the government has exercised its right of eminent domain and the circumstances of governmental land takings is unknown (GOCAR Constitution 2004; ARD 2007a; Furth 1998). CAR’s formal judiciary is weak and lacks independence from the executive branch. Court decisions often lack objectivity, are politically and tribally motivated, and are contrary to existing law. Court procedures are lengthy and costly, and the right to a fair trial not guaranteed. The court system suffers at all levels from a shortage of trained personnel, a lack of essential materials and resources, and corruption plagues the lower courts. The extent to which traditional systems of dispute resolution and customary forums are in use in CAR is unknown (ICJ 2005; FP 2009). Traditionally, women in CAR were engaged in dispute prevention and resolution. Women are considered the family and community members who represent principles of peace and harmony, and chiefs and councils of elders sought out the judgment of women in resolving community disputes and facilitating conflict resolution. The extent to which traditional dispute resolution forums currently include women is unknown, but NGOs in CAR are working to revive the tradition as a means of reducing social unrest and stabilizing the country (Mathey et al. 2001). CAR has a history of authoritarian regimes and coups, and it was 10th on the 2008 list of Failed States. However, CAR’s government successfully formed a coalition government in 2009 and has begun efforts toward strengthening its core state institutions and bodies. The government continues to be challenged by rebels and has been unable to exert much control over its remote provinces (World Bank 1998; Foreign Policy 2009; UNESCO 2006; FP 2009). The government began the process of creating a new land tenure policy in 1986 in order to update colonial era land policy and land legislation from the early 1960s. The government was unable to reach sufficient agreement and garner enough political support for the new policy’s adoption. No new efforts to adopt a policy or draft a land law are reported. The coalition government has identified agriculture as an area for growth and development. The government plans to boost existing initiatives by: providing funding for agricultural equipment, inputs, and marketing; relaunching production chains; promoting agricultural products processing; and providing marketing support (GOCAR 2007; World Bank 1998; Furth 1998). Most of the work of donors in CAR is directed toward humanitarian aid, security, and restoration of systems that have been destroyed by political upheaval and violence. USAID does not have an office in CAR; its work in CAR is within its East Africa program and focuses on: strengthening democratic institutions; promoting citizens’ awareness of democratic processes; and building rural roads. Since 2007, USAID has partnered with the US Department of State to implement the Property Rights and Artisanal Diamond Development (PRADD) Pilot Project. The project is being implemented in CAR and Guinea, and, in addition to achievements in securing mineral rights for artisanal miners, funded a comprehensive analysis of the legal framework for land and other natural resources in CAR (USAID 2010; ARD 2007a; USAID 2008). The FAO has been engaged in restoring agricultural production systems and assisting the agricultural sector to cope with the loss of equipment and seed stocks due to violence and social insecurity. The World Food Programme (WFP) is operating a food-for-agricultural-work program, and Mercy Corps in engaged in agricultural development initiatives, including seed-distribution programs. None of the programs appear to have components addressing issues of land access and tenure security (FAO 2006; WFP 2009; Mercy Corps 2009). The African Development Fund (ADF) and African Development Bank (AfDB) are working with the government to design a strategy for economic growth and job creation through support for governance and the development of basic rural infrastructure. The United Nations Development Programme (UNDP) undertook a 5-year program (2007–2011) to improve the living conditions for the poorest members of the population through: providing tools for participatory preparation of development plans; support for development of the legal framework and judicial reform; conflict management programs; and policies for the preservation of natural resources (UNDP 2006; AfDB 2009a). The Chad Basin in the north and the Congo Basin in the south are the foundation of CAR’s water resources. The rivers flowing from the two basins and their tributaries travel in opposite directions and provide surface water for the entire country. The Ubani River, one of the tributaries of the Congo River, forms part of the southern border between CAR and the Democratic Republic of Congo (DRC). The country’s southern tropical zone receives between 1500 and 1800 millimeters of rainfall per year. The Sudano-Guinean zone in the center of the country has a tropical moist climate, receiving about 1100–1500 millimeters of rainfall annually. The northern Sudano-Sahelian band receives between 800 and 1000 millimeters per year, and the dry Sahelian zone further north has erratic rainfall and frequent droughts. CAR’s internal renewable water resources amount to 141 cubic kilometers per year. Eighty percent of CAR’s water is used for agriculture, 16% for domestic use, and 4% for industry (World Bank 2009a; GOCAR 2006; FAO 2005; ARD 2007a). The country’s water levels are declining, and surface water quality is rapidly deteriorating, suffering from pollution from human waste and serving as a vehicle for disease. Only about 32% of the rural population has access to safe drinking water, and about 10% of the population has access to sanitation facilities. Urban centers were better served until the most recent years of political upheaval (1996–2003), during which much of the water supply system and infrastructure for water delivery and sanitation was destroyed or collapsed. By 2008, roughly 30% of the urban population had access to safe drinking water (UNESCO 2006; FAO 2005; AfDB 2009b). CAR’s 2006 Water Code (Loi No. 06.001 de 12 avril 2006 Portant Code de L’eau de la République Centrafricaine) provides that all of the country’s surface and subterranean water is in the public domain. No one can prevent the free movement of the country’s surface and groundwater, and any use of the water must be authorized by the government. The Water Code does not expressly recognize customary water rights (ARD 2007a). The 2006 National Water Supply and Sanitation Policy (Décret No. 06.170 de mai 2006 Portant Adoption de Document de Politique et Strategies Nationals en Matière d’Eau et d’Assainissement en République Centrafricaine) embraces an integrated water resources management approach; the policy does not reach issues of the water rights of individuals or communities but anticipates future revisions to the Water Code and recognition of customary water rights. The Water Code recognizes the existence of “sacred waters” and provides for their protection by community leaders (ARD 2007a; GWP 2006; FAO 2009; WHO 2000). The Water Code provides that the country’s surface and subterranean water is the patrimony of the state. Authorization is required for water use and diversions. The Water Code grants an exception for water collected from rainwater or through private construction efforts, such as an artificial basin. Such water is considered the private property of those who made the effort to collect it (ARD 2007a). The Water Code provides for the imposition of water user fees. Water users are also responsible for paying for any pollution of water resources or damage to water quality. The extent to which the government is able to collect fees or enforce anti-pollution measures is unknown (ARD 2007a). While little is reported regarding customary water rights in CAR, customary water law in the region includes the following general principles: (1) water resources are owned by the clan or community and should be managed in a manner that allows all members to have access to water; (2) water rights attach to land rights, and landholders generally have free and unlimited access and use-rights to water on their land; (3) rights to control water sources are often earned in relation to the amount of labor and resources expended to develop the water source; (4) landholders may not divert or block watercourses that traverse their land; and (5) pastoralists and other migrant populations should have rights to use community water but should obtain permission of the community or clan leader and abide by any restrictions imposed (Orindi and Huggins 2005). In Muslim communities (15% of the population of CAR), some Islamic principles continue to govern water rights. Under Islamic law, water is in the public domain, generally not subject to private rights of ownership, and any use must preserve the overall resource for the community (Caponera 1992; Husseini 2008). The Ministry of Water, Forestry, Hunting and Fisheries has authority over the country’s water resources. The Ministry of Agriculture and Livestock has authority over irrigation water and systems, and the Ministry of Public Works is responsible for urban water supplies and systems (GWP 2006; FAO 2005). The government of CAR is a member of the Global Water Partnership, which is committed to the Integrated Water Resources Management Approach (IWRA) to water management. The IWRA is based on the recognition that water has ecological, social and economic uses, and that water management has to recognize the various uses and integrate separate systems to the extent possible. CAR’s National Water Supply and Sanitation Policy and the Water Code were significant steps toward adoption of a regulatory framework that embraces the philosophy of equitable and sustainable management of water resources and support for providing access to safe drinking water and sanitation facilities nationwide. The government has also targeted the development of irrigated agriculture and has set the following goals: the development of a master plan for irrigation, the promotion of vegetable cultivation in peri-urban areas, and development of irrigation systems for 3000 hectares of lowland and 1000 hectares of land used by small market gardeners by 2010 (GWP 2006; FAO 2005; AfDB 2009b). In response to the lack of clean water available in northern-central conflict areas of CAR, 14 aid agencies joined forces in 2008 in a comprehensive response that included digging new wells, providing water pumps, and repairing infrastructure for water delivery to more than 1 million people (Snauwaert 2008). The African Development Bank is supporting a GOCAR 2010–2012 project to provide drinking water and sanitation facilities to three divisions. The project is expected to: (1) rehabilitate and extend the drinking-water supply systems in Berberati, Bouar and Bossangoa; (2) build 60 standpipes, make 2300 low-cost connections, construct 48 boreholes, two stand-alone water points, and 34 simplified drinking-water supply networks; (3) construct latrine blocks and landfills; and (4) provide training and capacity-building (AfDB 2009b). CAR has about 23 million hectares of forestland, an estimated 1800–3000 hectares of plantation timber, and a 1000- hectare rubber plantation. CAR’s forestland is highly diverse, including the Sudano-Sahelian steppes in the northeast of the country, dry and wooded savanna, woodlands, and dense equatorial forests in the southern region. The semi-deciduous rainforests in the southwest corner of the country and south-central area along the border with the DRC are some of the densest in Africa. The majority of the country’s extensive protected areas (15% of total land) are in the northeastern section of the country; in 2005, only 300,000 hectares of closed forest was protected (ITTO 2005; APFT n.d.; IRIN 2007; Ngatoua n.d.; Usongo and Nagahuedi 2008). Forestland provides CAR’s population with sources of fuel, food, shelter, medicinal plants, grazing land, and building materials. The forest is home to 20,000 pygmies, most of whom rely entirely on forest products for their livelihoods. CAR’s forests include about 200 species of mammals (including gorillas, bongos, and forest elephants), 670 bird species, and 3600 species of plants. Nine of the mammal species are endangered or threatened (ITTO 2005; IRIN 2007; Mathamale et al. 2009). Environmental degradation is less severe in CAR than in other parts of central Africa. The violence and social instability have caused people to migrate from rural areas to urban centers, which has taken some of the pressure off the forests to provide for livelihoods. Nonetheless, deforestation is occurring at about 0.1% per year, mostly attributed to farmers clearing forest for agriculture, logging, and bushfires. The timber industry has extensive operations in CAR’s forests and provides CAR’s main source of export earnings (53%). In 2005, the 10 timber companies operating in the southwestern forests were all foreign owned. As the industry expands into increasingly larger areas of CAR’s forestland and cuts logging roads that increase access to the forest, deforestation and overexploitation of non-timber forest products increases (AfDB 2009a; Usongo and Nagahuedi 2008; IRIN 2007; ITTO 2005; World Bank 2009a). The current CAR Forest Code (Code Forestier de la République Centrafricaine) was adopted in October 2008. The Forest Code provides for state ownership of the country’s forests and divides the forests into the permanent forest domain and non-permanent forest domain. The country’s permanent forests are located in Bangassou in the eastern part of the country and the southwest forest system. Non-permanent forests are those created by local governments, individuals, and groups through arboriculture and forest restoration activities (ARD 2007a). The Forest Code recognizes customary rights to forest resources, granting local communities use-rights to forest land and forest products. All use-rights recognized by the formal law are subject to state definition and control (ARD 2007a). The Yaoundé Declaration of 1999, which was signed by CAR, Cameroon, Chad, Democratic Republic of Congo, Republic of Congo, Equatorial Guinea, and Gabon, established an international framework for collaboration on cross-border forest issues, the creation of protected areas, and the development and implementation of coordinated sustainable forest management. The declaration also created a governance structure, the Central African Forests Commission (COMIFAC), which has the authority to direct, coordinate, harmonize, and monitor forest and environmental policies in the region (Usongo and Nagahuedi 2008). Under the Forest Code, the permanent forest domain includes state forest domain and public forest domain and encompasses all economically exploitable forest resources. The majority of the country’s forestland is state forest domain, including production forests, forest reserves, game parks, and forests that are subject to industrial and artisanal exploitation permits. The state has the authority to grant forest exploitation and development permits for unlimited time periods. The Forest Code assigns local villages and/or indigenous communities a decision-making role in the granting of exploitation permits and requires the entities receiving exploitation and development permits to contribute to the social well-being of the local communities. The state must also consult with the local population, including indigenous communities, before granting a concession for industrial exploitation of the forest. Artisanal permits are available for small-scale and non-mechanized exploitation of forest resources (ARD 2007a; Mathamale et al. 2009). Individuals and entities developing non-permanent forests can obtain rights to forest resources, consistent with government regulations (ARD 2007a). The Ministry of Water, Forests, Hunting and Fisheries (MEFCP) is responsible for management of the country’s forests. The country is in the process of developing capacity to manage natural resources, including capacity within the MEFCP, which has suffered from the lack of a legal framework and governance structure, lack of human and financial resources, inability to manage areas affected by conflict, and corruption. CAR’s first Poverty Reduction Strategy Paper (PRSP) (2008–2010) includes support for MEFCP. As of the 2009 PRSP Progress Report, work on strengthening the legal framework and developing some supporting initiatives within MEFCP was progressing (FAO 2010; World Bank 2009c). In May 2000, the CAR, Cameroon, Chad, the Democratic Republic of Congo, Equatorial Guinea, and Gabon (signatories of the Yaoundé Declaration) established COMIFAC as the governance body for the Congo Basin forests. A treaty in 2005, in which these countries were joined by Angola, Burundi, Rwanda, São Tomé and Príncipe, made COMIFAC into a legal entity with responsibility to coordinate all conservation measures in the region. The regional umbrella structure, the Congo Basin Partnership, brings together all stakeholders (governments, NGOs, indigenous forest peoples’ groups, researchers, donors, the private sector, and civil society) to implement Congo Basin initiatives (Usongo and Nagahuedi 2008; CBFP 2010). CAR is also a member of the Congo Basin Forest Partnership (CBFP), which was launched at the 2002 World Summit on Sustainable Development in Johannesburg as a voluntary multi-stakeholder initiative contributing to the implementation of the Yaoundé Declaration. All COMIFAC countries are members of the CBFP, along with other member governments (Canada, France, Germany, Spain, Japan, South Africa, the Netherlands, the United Kingdom, Norway, United States, and the European Commission), donor agencies, international organizations, NGOs, scientific institutions, and representatives from the private sector. CBFP works in close relationship with COMIFAC and serves as a conduit for communication between donors and implementing agencies and provides a forum for dialogue and cooperation among partners (CBFP 2010). In 1990, CAR established 120,000-hectare Dzanga-Sangha Special Dense Forest Reserve. The Sangha Tri-National Area, which includes the reserve, is identified as one of 12 priority areas for the Central African Regional Program for the Environment (CARPE). The government has adopted a partnership approach to managing the reserve that includes engaging the local communities. A local nongovernmental organization, the Committee for Development of Bayanga (CDB), was created to facilitate the participation of local communities in decision-making relating to the reserve. Very little information regarding the community participation efforts is available, but one 2008 study reported that local Bayaka communities were dissatisfied with their relationships to the government officials and the international and local organizations operating in the reserve; the Bayaka communities sought more control over forest access, more control over the type of projects undertaken in the forest, more participation in the projects, and greater sharing of benefits from project activities (Ngatoua n.d.; Nelson 2008; Blom 1998). The government’s Poverty Reduction Strategy Paper for 2008–2010 identified the need for good governance in the management of the country’s forest resources to increase the sector’s value. Specific planned activities included: increasing and diversifying forest production and implementing existing forest development plans; funding a forestry and tourism initiative; and engaging communities in management of forest resources. As of the 2009 progress report, the government was moving forward on implementing an Africa Forest Law Enforcement and Governance (AFLEG) action plan in order to reinforce the laws against illegal logging and trade and wildlife-poaching and to ensure access to the EU market. The government created a forest observatory, an economic intelligence-gathering tool designed to support decision-making and supply reliable and relevant economic information on the industry. The government also initiated a program to share revenues from forestry and wildlife enterprises with communities. Revenues are deposited in a bank account opened in the Central Bank in the name of the communities, and are supervised by a technical committee comprising representatives of the ministries concerned (Interior, Finance and Budget, Water, Forests, Hunting and Fisheries) to help ensure transparent management of the revenues for the benefit of communities (GOCAR 2007; IMF 2009a; World Bank 2009c). The Ministry of Water, Forests, Hunting and Fisheries (MEFCP) is working with the World Resources Institute (WRI) to improve the quality and availability of information on CAR’s forest sector and build the country’s remote-sensing, GIS, and forest information management capacities. One of the major products of the collaboration is an Interactive Forest Atlas of CAR. The Atlas, which targets stakeholders working in the forest areas, is available on a CD-ROM and presents forest information in an easy-to-use, publicly accessible format (WRI 2010). USAID supports CARPE through the Biodiversity Support Program consortium. CARPE engages African NGOs, research and educational institutions, private-sector consultants, and governments in evaluating threats to the forests in the Congo Basin and identifies opportunities to manage the region’s forests sustainably. The European Commission supports programs such as the Ecosystèmes Forestiers de l’Afrique Centrale (ECOFAC) and the Avenir des Peuples des Forêts Tropicales (APFT), which are multi-disciplinary projects managed in large measure by anthropologists investigating and documenting the future of the peoples of the rainforest (CARPE 2001; APFT 2009). The Government of Germany is supporting a three-year (2009–2012) US $3.8 million project designed to support the sustainable development of non-wood forest products for food security and income-generation by local communities in five central African countries, including CAR. FAO is implementing the project. Two of the priority landscapes identified by COMIFAC are in CAR. In these priority areas, international NGOs such as the World Wildlife Fund (WWF), government forest administration, local communities, NGOs, and private partners such as logging companies are engaged in collecting data and developing plans for sustainable resource use (Usongo and Nagahuedi 2008; FAO 2010). The CAR is rich in mineral resources, including diamonds, copper, gold, graphite, uranium, iron ore, tin, and quartz. As of 2006, only diamonds and gold were being developed, and production was mostly artisanal. A large number of international companies are engaged in gold and petroleum exploration. The mining sector accounted for 7% of GDP in 2007, and rough diamonds were one of the country’s leading exports (Bermudez-Lugo 2006; USDOS 2009). CAR is a member of the Kimberley Process diamond certification scheme. The process was implemented to control the flow of rough diamonds into and within international markets and to combat the sale of “blood” or “conflict” diamonds, which were used to fund armed conflict and rebel activities. The Kimberly Process, which was initiated by the UN and the World Diamond Council, requires the certification of all diamonds mined and also at the time of each transfer of ownership of the diamonds. The process has generally been considered successful, but most governments – including CAR’s – have lacked the institutional capacity to apply controls to small-scale alluvial mining operations, which often continue to be unregulated and unregistered (ARD 2007a; ARD 2007b). The 2009 Mining Code, Loi n° 9-005 du 29 avril 2009, governs mining activities in CAR. Article 6 of the Mining Code provides that all mineral resources are the property of the state. Entities and individuals can obtain rights to CAR’s minerals, and rights to minerals are separate and distinct from rights to land. The objective of the Mining Code is to promote and encourage research, exploitation, processing, and marketing of mineral resources for social and economic development. The Mining Code recognizes customary property rights and requires license holders to compensate holders of customary rights for damage to land or loss of land-use resulting from mining operations (GOCAR Mining Code 2009). Local customary tenure rights and rules, which govern much of the country’s agricultural and forest land, tend to be weak at mining sites along waterways. In the years following Independence, migrant miners claimed land along rivers for alluvial mining. In many areas that have been studied, the miners, who are known as chefs de chantier, did not seek rights through customary authorities. The miners claim rights based on their assertion of rights to unclaimed sites and use of the sites for mining. Most potential sites have been claimed, but where mining sites are unclaimed, the area is often considered open-access with rights available to those to assert their interest against outsiders and conduct traditional mining operations. In study areas, local governments, traditional authorities, and mining operators look to formal civil law to govern mining interests. Local government officials enforce the formal law, but chefs de chantier often have no knowledge of the legal requirements. Miners reported some knowledge of the need for artisanal licenses but had only limited (if any) knowledge of the Kimberly Process requirements for production logs and reporting; miners complain that government enforcement is arbitrary and self-serving. In some areas a class of middlemen is emerging between the chefs de chantier and the government. In these areas, middlemen facilitate relationships with the government and in some cases seek to obtain formalized rights to mining areas, threatening the interests of the chefs de chantier (ARD 2007b). The 2009 Mining Code regulates the mining sector through a system of permits and licenses. The rights granted are categorized as either industrial or artisanal. Individuals and entities can obtain one-year, renewable prospecting permits. Exploration permits are available for three years for areas up to 500 square kilometers, with two renewals. Mining licenses are granted to industrial miners for periods of up to 25 years, with renewals available for five years each until the deposit is exhausted. Licenses are obtained through application to the Minister of Mining and Energy, who (in conjunction with ministers responsible for environment, labor, territorial administration, and commerce and finance) provides a report to the Council of Ministers. The Council of Ministers issues a decree granting the license (GOCAR Mining Code 2009). Under the 2009 Mining Code, mining companies are required to give the state a 15% share in any mining operation. Mining companies are also required to provide programs to employ and train CAR nationals in the industry, to assess potential social and environmental impacts of mining operations, and to develop and implement mitigation plans. The Code also requires mining companies to reach agreement with landowners impacted by mining operations for compensation for loss of the use of land, with a forum for dispute resolution provided by the Ministry of Mining and Energy in the event that parties are unable to reach agreement (IMF 2009b; GOCAR Mining Code 2009). Artisanal mining licenses are available for periods of three years, and are renewable for an additional three years. All artisanal miners must have valid permits to engage in artisanal mining. Artisanal miners must be CAR nationals, while no such restriction exists for industrial miners. All permits and licenses are subject to the terms and conditions established by the Ministry of Mining and Energy (formerly the Ministry of Energy Resources and Mines). The Ministry can terminate the permit and mining title for failure to abide by the terms of the contract or at the end of its period of validity (GOCAR Mining Code 2009). The Ministry of Mining and Energy is responsible for the mineral sector. Production of diamonds and gold is overseen by the Bureau of the Evaluation and Control of Diamonds and Gold (Bureau d’Evaluation et de Control de Diamant et d’Or) (BEDCOR), which maintains a database of production (Bermudez-Lugo 2006). The government adopted the new Mining Code in 2009 as part of its efforts to improve governance of the mining sector and encourage investment. The 2009 Mining Code establishes a system for granting and managing mining licenses that is more transparent and limits government discretion. The government has adopted a model contract that standardizes the terms of mining investments and facilitates the development of agreements between mining companies and local communities. The government is seeking to increase mining production and reduce the poverty rate of communities in mining areas by: setting up a geological database; establishing an institutional framework and incentive-based regulations; encouraging transparent sector management; and developing small, medium, and large mining companies (IMF 2009b; GOCAR Mining Code 2009; GOCAR 2007). The CAR government joined the Extractive Industry Transparency Initiative (EITI), which was created to provide a foundation for improved governance in resource-rich countries through the verification and full publication of company payments and government revenues from oil, gas and mining. CAR’s efforts to develop and strengthen its governance of the mining sector include establishing a national steering committee and multi-stakeholder group to provide oversight of the sector, and engaging an independent director to collect and reconcile accounts (EITI 2009; IMF 2009b). USAID and the US Department of State are partnering on the Property Rights and Artisanal Diamond Development (PRADD) Pilot Project. The joint initiative was launched in 2007 and is operating in CAR and Guinea. The project funding was US $5.4 million in 2008. The project fills the gap in application of Kimberly Process controls to alluvial mining operations by bringing alluvial diamonds into the formal chain of custody. PRADD staff collaborated with CAR’s Ministry of Mines and other stakeholders to analyze the dysfunctions of the alluvial diamond sector to determine how to strengthen property rights and to demonstrate, in selected pilot areas, how reinforced property rights would increase local benefits from production and marketing of alluvial diamonds. The project has: (1) created a property rights registry and processes to acknowledge and validate artisans’ mining claims; (2) created a process to resolve disputes over artisanal mining claims; (3) created a GIS database to facilitate tracking diamonds from extraction to export and tying diamonds to a particular miner and place of extraction; (4) provided capacity-building for ministry officials; and (5) increased miner awareness and negotiating capacity regarding their rights and procedures for securing their rights. Whether the project can be scaled-up or its models used in piloting other natural resource governance projects has yet to be determined (ARD 2007a; USAID 2008). The World Bank hosts the West African Mining Forum, which organizes discussion among governments, private companies, and civil society members in West Africa and CAR. The forum’s purpose is to promote the sustainable development of mineral resources in the region (World Bank 2009b).